This was my second attempt at making this apparently delicious side dish. I personally hate Brussels sprouts so when I made them over Christmas using this recipe, I was surprised (and very happy) that they turned out to be so yummy! The Christmas version, however, was full of buttery goodness, so I wanted to see if a healthier version of the dish would taste just as good. Unfortunately, using olive oil instead of butter kept the bitterness of the sprouts, but the nuts again came to the rescue. It makes for a good accompaniment to a red meat dish but since we were eating a horrendous version of a store-bought Arrabiata at the time, our taste buds were already overloaded with peppery bitterness from the sauce. 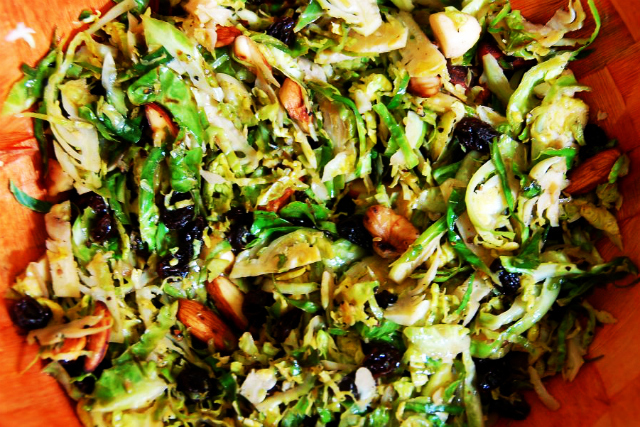 After ridding myself of the Arrabiata, I found the lightness of the sprouts, with the slightly bitter flavour coming from the sprouts and the roasted nuts, to be be somewhat pleasant. It's at least an excellent way to get rid of leftover Brussels sprouts after a Christmas meal! Roast nuts in a hot pan on high heat. Stir them around to avoid burning. Add brussels sprouts. Season with salt and pepper and stir. Add nuts and raisins. Cook, stirring occasionally until brussels sprouts are crisp-tender. Remove from heat, add lemon juice, stir, and serve!